Not only is this clean, comfortable and the right price, it's also relatively unknown. Club Coral Coast is one of those little places that you simply won't find by browsing on TripAdvisor, or searching the internet. We decided to contact the owners and make a visit, just to see if it was worth including in our recommendations. We had heard rumors about the existence of this place, but it was hard to track down any concrete information (do a Google search for club coral coast, and you will see what we mean). We stayed overnight, talked to staff and guests, and took some photos. Our evaluation was... "what a great place to stay, if you are on a tight budget". Guests that were staying during our visit commented on how friendly and helpful the staff were. That is always a good sign, and shows that the the people working there really do care about you. That can make or break a vacation. Club Coral Coast is on the bank of the canal that runs through the town, and empties into the Beqa lagoon. Once you can make your way to Pacific Harbour, then you can get a courtesy pickup from the town center. There are regular buses that run from Nadi aiport which will cost about fj$20 and take around 3-3.5hrs (prices current as of 2012). Club Coral Coast will also run a mini van service to pick you up from the airport, if you are travelling in a large group of 8 or more. At fj$32 a head, you might want to spend the few dollars extra and do this, as it is a quicker more personalized door to door service. And of course, you don't have to put up with all the stops that a coach will make. 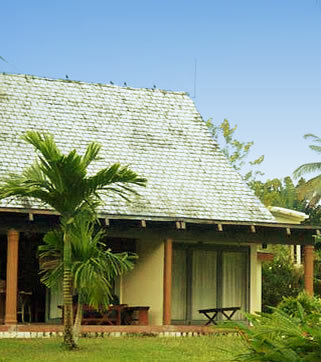 There are three grades of accommodation at CCC: Deluxe rooms, standard, and backpacker room. And with a total of only 10 rooms in total, this place is never going to get overcrowded. 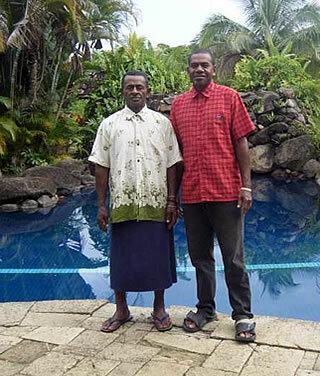 These rooms are not done up to look like traditional Fijian bures, as you see at most resorts. Instead they are small self contained units, such as you would find at higher class camping grounds in NZ or Australia. Deluxe: (3 units) fj$170 a night (2 people) this has a king sized bed, bathroom, kitchen and cooking facilities. 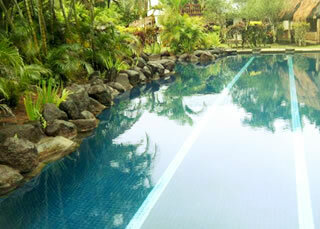 Backpackers: (3 units) fj$50 a night (2 people). Generally when you mention the word "backpackers", you imagine a dorm with bunks. Not so at Club Coral Coast... these are private rooms. The main difference between these and the deluxe and standard is that facilities are shared. However, you have your own private room, and double bed instead of bunks. Very nice! And at fj$25 each per night, this makes for a very cheap stay for two people. Certainly better than rooming with strangers, in our opinion. 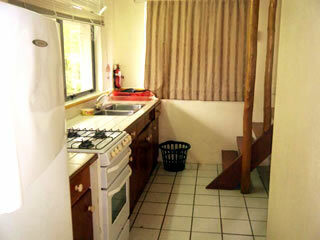 The units come with towels, bedding, fridge, tea and coffee making, iron, toaster and general kitchen utensils. So you have the choice of either using one of the local Pacific harbour restaurants/cafes, or cooking for yourself. There is no bar or restaurant on site, so bring all your own food and alcohol. The main attraction of this place is the peace and quiet, lack of crowds, and the fact that you can just relax. CCC can organize fishing, mangrove tours, or get a nanny/babysitter for you, if you want to get out and about. 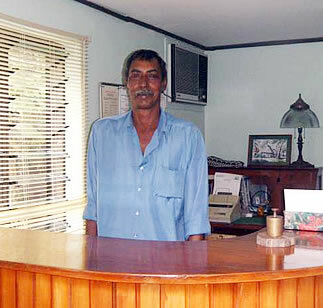 Ask Vijen at the front desk for some ideas on what to do around Pacific Harbour. He will be happy to help with suggestions, order you a taxi, book a tour etc. If you wish to make enquiries, then please use the email address below, do not email this website. This is one of those little gems that you just dont get to hear about, unless you strike it lucky. It's close enough to everything to make it a great base, yet is quiet enough that you can relax without having to listen to crying kids in the next unit. The big attraction for us was the ability to self cater. You have your own kitchen, with stove, fridge, and cooking utensils. Many places simply don't allow you to do much more than make a cup of coffee...they prefer you to eat and drink at their own restuarant and bar. While that's great for socializing, it can get a bit hard on the wallet. And if you are on a budget, saving money by purchasing and preparing your own food can really make a difference. So don't think of this as an "all inclusive resort". It's not. Instead, think of it as a great place to get some peace and quiet, yet still be close enough to all the activities available in the Pacific Harbour region. If you want to find more information about what's on offer in the Pacific Harbour area, we have a list of resources here. Each of these websites will show you all about their own particular activity. From zip lining in the forest canopy, to shark feeding around Beqa.